We have read an encyclopedia article by Abrams that summarizes research into computer-mediated communication in the context of second language education. Abrams points out that it has been acknowledged that computer-mediated communication (CMC) is conducive to second language teaching and learning. Research findings suggest that in comparison with face-to-face interactions, CMC enables learners to engage more fully in interactions (Kern, 1995; Warschauer, 1996), adopt a wider range of discourse functions (Chun, 1994), perform various participant roles (Abram, 2001) and prompt different ways to negotiate meanings (Blake, 2000; Smith, 2004). Furthermore, from the sociocultural and ecological perspective, CMC serves as a tool to foster interpersonal communication. Relevant studies are predominantly based on a sociocultural understanding of language learning and focus on the social practice of interaction. Belz (2002), for example, believes CMC as an online exchange facilitates the development of learners’ interactive communicative competence (ICC). Learners from different cultural backgrounds benefit from language practice and the learning community. As stated above, CMC is considered as an effective way to counteract the limitations of traditional classroom interaction. It is easy for us to find quite a few examples to support the idea. WeChat, as a medium of CMC, allows language learners to share what they have learned in the Moments. Each learner, therefore, has the chance to show their learning outcomes and get comments from others, including more advanced learners or less advanced ones, which motivates learners themselves and their friends. Skype is also an effective way to communicate with native speakers. I have two English teachers from Britain during my undergraduate years, Emma and David. They set up a chat group with my college classmates. Emma always asks some questions concerning Chinese culture and customs. Very active responses from my college classmates will be provoked. It is not uncommon for the others to offer further explanations if someone does not make himself clear. Emma also shares some video clips featuring western culture, so differences between the two cultures become a topic of interest. It provides us an authentic and synchronous situation to achieve cross-cultural communication. My classmates, I find, become more outgoing, willing to express their own ideas in a relaxing way via Skype than in class. But some drawbacks, or to be more exact, worries about CMC cannot be ignored. Even though learners rely less on instructors and manage their own interactions, a problem arises that without guidance, it is not easy to implement systematic and comprehensive learning. Perhaps the topics chosen are not suitable, the learning process is probably not well-organized or some difficult points may not be given enough attention. What’s more, the establishment of a learning community requires meticulous planning and careful selection of members. Learners tend to group together with people sharing the same interest as they have much in common and are more likely to continue their talk. But it means that there may be no more advanced learners in the community, which often impedes the learning progress. Learners cannot reach a higher level of proficiency. In terms of second language learning, we think the advantages of CMC still outweigh its disadvantages. It is, hence, necessary to come up with methods to reduce these disadvantages to a minimum. Therefore, I’d like you, my dear classmates, to have a discussion about your experience of CMC in learning or teaching a second language. How have you used CMC in your own language learning or teaching? What good and bad experiences have you had? Do you have any good ideas about how to ameliorate the experience? Alternatively, with the advent of AI, you are encouraged to describe what ideal CMC in second language learning will be. This entry was posted in Computer-mediated communication. ← Is writing fanfiction helpful? Tracing back to the period during which I was struggling with the most conventional but dullest mode of English classes in the senior middle school, I continuously questioned what we were taught English for——-we learned a foreign language analytically and non-communicatively. We were constantly reminded of metalinguistic terms and concept and trained to foster proficiency in reading and listenling comprehension, yet English was no more a communicative tool, for this language was, in most cases, studied under decontexualized situation. However, inspired by the course, I start to reflect any possibility of a combination with network technology with Laguage usage. Language is mainly for communication. Topics and tasks can provoke chances for language learners to apply what they have learned. One usual way of language excercise is debating and discussion, which enable speakers to better experience interpersonal interaction and peer feedback as stimulating rewarding. Some of you may be amused by the first sentense I put in this comment : one typical expression of genre discourse in ZhiHu( do you know? )——one of the most popular online platforms for question-to-answer website. One comes up with a question and then other netizens who may know the solution would try to answer. Students would be stimulated when questions are related to what they are acquainted with. They would probably search for information that could help solve the problems asked by their fellows.They could also enjoy the convenience of mutual peer feedback at the comment section. English would serve as a commucative tool during this process. Passion and motivation would be aroused with the intention to help their puzzled classmates. The process of searching for information and confirming the reality help establish their independent reseach skills and self-learning skills. Their discussions in the comment section function as task-based and content-based teaching approach, but in a more interesting way. Your sharing of learning English in the classroom in a passive mode, and then contrasting it by proposing a communicative learning tool, is a thoughtful one. It brings out learners’ want to interact with each other in their pursuit. The recommendation of ZhiHu is a good choice as well (I elaborated my thoughts in a separate entry), as it is a tool that addresses students’ intellectual need, while also providing the kind of affective support seen in other CMC platforms. Hi, Wei Chi. Thank you for your comment. Searching for infomation and judging its credibility, as you mentioned, is really a necessary skill for students’ independent learning but it does not attain enough attention. Often, language teachers confine their teaching to the four basic language skills but ignore other aspects, like how to develop students’ ability to gather information and look critically at the information they have found. Therefore, students should be encouraged to take advantage of CMC to improve their language proficiency and at the same time explore the world on their own. The context of learning English shifts dramatically nowadays. It is common for us to learn English in some social networks and learning websites or apps. Personally, I prefer to learn languages through reading some articles and news worldwide, which is not merely good to language facilitation itself but also some positive concepts and beliefs they convey. But I think this way of learning is more suitable for language learners of intermediate levels who are able to discern right and wrong in a wider community. I agree with you that CMC suits intermediate learners better. I used to introduce a language learning APP to my 9-year-old nephew, but she found it is not that useful to her. Hi, Doreen. I think you are right. CMC enables learners to manage their interactions without relying on instructors, which also requires that the learners are capable of planning and implementing their learning by themselves. For some beginners or young learners, it is not a easy job to finish this process without guidance. As for me, WeChat is not just a tool for keeping contact with my families and friends, but also a platform for language learning. Besides communicating with several foreign friends on WeChat, I also follow some Official Accounts which are related to English studies. In this way, I am able to improve my English skills in different aspects and at any time I want. For example, I has followed “China Daily” for about one year, and I always read some interesting and informative news that posted on this Official Account. In addition, I sometimes post my own thoughts or confusion under the articles, and the author of the post or the manager of the Official Account might reply and answer my questions. Another useful CMC is “ZhiHu” which is a great platform for learners to deal with confusion and gain information. Mostly, people with professional knowledge might be invited to share their understanding of specific questions. With these CMC, I am able to improve my reading skills, enlarge my vocabulary, communicating ability, and broaden my horizon. Hi, Michelle. I had also followed the official account of China Daily for a long time and I think it facilitated my English learnig. But an American friend told me that China Daily was quite good yet sometimes still very odd for their native speakers. The expressions and the way to construct a passage are different from their habits. He then recommended me Washington Post and the Guardian, which he believed suited my English level. So this is why we are worried about CMC. Among so many CMC choices, no one helps decide which one suits us best. Hi, Eric. My English teachers in college also recommended me Washington Post, which is really useful I think. Actually, I myself also found some expressions in China Daily are kind of Chinglish sometimes, so we need to distinguish useful knowledge from misleading one when we use this kind of learning materials. In this respect, people with professional knowledge, like teachers and native speakers, might be able to give learners some practical suggestions. Besides, everyone has his/her own learning habits and personal knowledge-bank, which means learners also need to take their own situation into account when they use CMC. I agree with the point that CMC is an effective way to counteract the limitations of traditional classroom interaction. I know that the English learning materials includes CMC program in recent English training centers. They offer corresponding on-line exercise to students after each class so that students can send their homework to the certain community belonged to their class. In the community, teachers, students and parents can all check the records and give comments. Therefore, parents can be clear about their children’s homework then supervise and guide them to finish, which gradually help students form good learning habit. However, using the CMC program may increase teacher’s workload as they have to work in holidays. It would be better if the company hired someone to handle this job. Hi Annie, what you are talking about is very interesting. With this community, parents can also be more involved in children’s learning process. It could also be treated as a platform where parents can communicate with teachers. I think it is useful and motivated to use CMC in the language learning and teaching. When I studied English back in college, my school mates and I also used communication tools like Skype to practice English. I think it is important and meaningful to have a community and tool for the students to learn and practice language use. In this virtual space, students can use the second language to develop authentic communications. In this way, it gives the students a special and exclusive space to use the language. CMC provides this kind of opportunity to students. Thanks for Eric, Vicky and Grace Fu’ post. CMC is a good tool in provoking new teaching techniques. I have been considering whether it is suitable or pragmatic to introduce these computer-mediated communication tools into schooling. If they were to be implemented, the schools would expect a large amount of expenditure spent on these technique tools. Meanwhile, students’ behavior is hard to control and monitor once they have the computers in hand. Their attention may be easily attracted by the advertisement which is irrelevant to the class. So the teachers have to care more about their students’ learning behavior rather than teaching. But, this situation could be improved. A viewpoint is that computers can be used after-class for both revision and preview. Students would be assigned a part of the homework that they have to accomplish via cooperating with their teammates online. Or they would be asked to experience online learning first and then share what they feel to the class next period. In this way, students would become responsible for the tasks and hardly would they be distracted by other things. As a faithful user of WeChat, I agree with you that CMC program like WeChat can be beneficial for second language use. Though I hardly chat with my friends in second language, there are many official accounts that can be used to language learning. In fact, as I have attended this course, I find it interesting to apply CMC program to language teaching and studying. It is fun that computer, APPs, and some communication tools are not only the places for fun and relax, they can also be used for studying. However, I agree with Annie that teaching online can increase the teachers’ workload. In addition, how effective the CMC program is, depended by how well the learners are exposed to the program and how motivated they are. From Doreen’s post, I guess she may resist using CMC as a approach to language teaching and learning, I know there are many students like Doreen, may regard CMC learning as a heavy load that they have to bear. In all, I believe CMC is conductive to second language use, and maybe we can design some programs especially for students who are motivated to this kind of approach. Hi Eric, Vicky and Grace Fu, as an English learner, I have used quite a few apps and websites in the process of learning English. The most frequently used app is Shanbay English to encounter more new words and master most of them. Actually I have used Shanbay to learn words for more than two years, the interesting thing is that users can get virtual badges if we keep using this app and finish daily tasks, which is very inspiring. In addition, you can join learning groups to keep learning with others and there are communities in which you can interact and ask questions. However, I gradually realize that I forget most of the words I learned. The voculary I acquire is lack of authentic context, although there are example sentences below each word, they are not enough to master usages of a word. Therefore, from my perpective, apps like Shanbay could be better if more authentic interaction is included. Hi, Julie, your mentioned experience also reminds me of my undergraduate time when Shanbei was well welcome and even became type of competition platform for our students. To be honest, in the beginning, I just used Shanbei to follow the trend of posting daily task completed page to Wechat among our classmates. However, I gradually found it did conducive to my vocabulary learning after a couple of months. Hence, this app is still adopted by me as one technique to check my students’ vocabulary memorizing work. Compared with traditional hardcopy vocabulary list, handy language learning apps seems acceptable for more young generation learners. As an English learner, I have experienced different types of CMC learning. Sometimes I use online learning forums to learn English. When I browse the forum, I can learn from others’ experience, leave my questions in the discussion area, wait for my answers to be solved and also help others with their problems. Sometimes I use learning APPs to learn English. I use CCtalk to read after the authentic pronunciation produced by native speakers and to communicate with English teachers online. I think this APP somehow improves my listening and speaking skills and what the most important is it raises my interest in English. The instant communication with other learners or teachers makes the process of learning more personal and interesting. From my own learning experience, I would say that CMC learning/teaching is more or less like a supplement to the traditional learning/teaching. The process of CMC learning/teaching always tends to be interesting and gives more space for learners to explore. However, the learning outcome is hard to be predicted. For example, I sometimes find wrong answers to the questions which are posted by other leaners on the forum. If they just receive and use the incorrect answers without considering the validity of them, it is actually harmful for their English learning. Another example would be our weekly posts on the website. Without the guidance of the professor, the content of the post will be out of control and may cause problems. So, what I suggest is firstly, CMC learning should be conducted under the guidance and instruction of certain language experts (teachers, native speakers) so as to make sure learners can actually benefit from the learning process. Secondly, CMC learning should be used as an auxiliary way for learners to acquire new knowledge rather than as the main learning way. hi, Crystal. Since you have mentioned CCTalk and I happened to experienced learning on it previously, so comments are made here. I used to look for the free class online since I won’t stick to a particular individual for quite a long time, since I am eager to experience different teaching styles which sometimes could help me generate ideas. At this point, for some courses charging fees, I would not take the chance to sign up for it, no matter how highly the words praised the teachers. In my viewpoint, the ideal and rewarding online learning should be provided for free. The people who are profit-oriented should not be allowed. This kind of platform is initiated to be a resource-sharing cyber space, and this respectful intention would be ruined by profitable aims. 1. A platform for posting and answering questions is more intellectual than the more conversation-based tools. As most students in Hong Kong consider learning English as a duty rather than for leisure, such a platform can be useful for nurturing their serious learning attitude. If they manage to reduce some of their careless mistakes as a result of persistent practice, the learning experience can be deemed as really successful. As for tackling the issue of motivation, students can choose topics that interest them for contributing their efforts. 2. Students can also learn to develop their arguments on a site like ZhiHu, an opportunity not so commonly found on most other websites. They can compare their answers with others’ as well. 3. A big advantage of an asynchronous platform is that it allows time for students to prepare their responses. This can boost their performance to a significant extent. 4. Getting ‘likes’ or ‘virtual badges’ at the end of posting one’s feedback should be highly motivating. 1. Many students in Hong Kong do not want to mix up chatting with school work. Thus asking them to chat in English is not enjoyable, unless they are enthusiastic learners of English. 2. Even though chatting may help students to sharpen their colloquial English, especially if they have native-like leaders among themselves, or a native-speaking teacher to coach them; yet, they may end up talking less when the teacher is present in the group. 3. If the tool is mainly adopted for training oral English, face-to-face communication is a better choice as it can also boost students’ confidence and delivery (I am aware that even synchronous tools may cover a range of functions, some of which allow face-to-face interactions. Still I would prefer to reduce the scope of discussion here). 4. As said, the development of arguments is a skill more urgently in need to be developed among students. Hence spontaneous, short exchanges on chatting platforms may not serve the purpose as ideally as asynchronous platforms. Hi, Camie. Thank you for your comment. But I don’t think there is conflict between synchronous and asynchronous CMC in language teaching and learning. Of course, asynchronous platforms can contribute to English learning, but synchronous CMC also have its unique advantages. It is known that in interactions, we are required to speak English spontaneously. This kind of ability to organize our speech immediately can never be well developed through asychronous CMC, which allows students enough time to prepare. Only in authentic and synchronous situations can students hone their skills to speak English fluently and naturally. Hi, Eric, Vicky and Grace, thanks for your impressing post. Speaking of CMC application to my English learning, I have joined a chatting group in WeChat for urging myself to insist on doing speaking practice everyday. The organizer would announce a speaking task every morning and we members hadto post our speaking record before due time, otherwise we would be moved out forcefully. It did supervise my daily practice and bring positive outcomes to my speaking proficiency. It seems the conducive role of CMC truly deserves to be acknowledged. However, as a teacher, I tend to adopt this teaching technique in adult learning classes rather than teenager ones. It is mainly because of their relatively weak self-control that electronic devices will easily distract young students from the assigned tasks. I do agree with your point that CMC does help our language learning and it also requires the self-control of the users. I can not help but distracted by some other apps, which will impede learning progress. Thank you for presenting such a thorough introduction to CMC. Despite its potential limitations, this new technique facilitate both teaching and learning if used properly. Hardly do I chat with friends in L2 on WeChat, because using L1 is more relaxing for me when I want to have a casual conversation with my friends at leisure time. But I do think it is an effective method of sharpening colloquial English. Like many other language learners, I have subscribed a wide range official accounts and used several APPs to sharpen my English proficiency. I found this way of learning is a good supplement to in-class learning as it allows me to utilize time pockets to reinforce what I have learned. Later on, I introduced it to my friend, she said she was distracted easily when learning on her phone and laptop and fragmented learning is not systematic enough. So the learning outcome of CMC may vary with individuals. Students should be allowed to decide their preferred mode of study of their choice. With regard to teaching, CMC will definitely come in handy. For example, it is conducive to students’ learning motivation. Also, the Internet makes it convenient for teachers to provide feedback for students and their parents. For all this, as what has been mentioned by Annie, using CMC may add more workload to teachers. Hi, Evelyn, it is your statement about official accounts that arouses my attention. To be honest, I have followed a great number of them of English learning, such as the BBC Six Minutes English or VOA Special English. But question is that the content they provide abound, and sometimes they update faster than we can digest. Do you experience the same thing? How many accounts you think is appropriate to follow at one time? Do you read the updates everyday? Additionally, it needs strong self-discipline, which means that you have to check the updates consistently, or else, you will lose lots of valuable information. For me, well, at least I will check them every two days, but also found it overwhelming. So what do you think? As I experienced, WeChat can be the facility for helping teaching and learning English reading and speaking. When I worked as an English teacher in junior middle school last year, I had used the print-screen of WeChat as a carrier of the topic of the unit in textbook. For example, I wrote the relative reading material into the form of the subscription of WeChat, in order to raise students’ interest in reading, given that nowadays students have got used to reading the passages provided by the subscription accounts on WeChat. And also, I tried turning the conversation among roles in the textbook into the text on WeChat, which attracted much students attention because they thought it was related to their daily life, but not just the things on the textbook. Apart from using the print-screen of Wechat during the class, students were asked to do some oral practices via WeChat after school. Some English teachers assigned oral English homework for students. In this way, students can record their speaking on the given topic on WeChat, and then send it to their teacher. It solved the problem that, in the past, students had no chance to finish the communicative oral English homework after school. Hi Laurel, your mention of oral homework reminded me that I had actually thought about the application of AI in language teaching before, especially in practicing oral skills. With the advent of virtual games where we can put ourselves in another virtual world, I was thinking maybe a set of systematic language game would also be invented where learners would practice their oral skills by communicating with a virtual person in that virtual world. They can make friends with them and even experience different circumstances together with them. I think this could be pretty helpful in dealing with the problem that lots of learners lack the opportunities to communicate with native speakers using the target language. Although it still sounds not so applicable now due to some technological and economic problems, I believe it could become a popular way of practicing oral skills some day. Hi, Eric, Vicky and Grace. Thanks for your sharing. I really agree that WeChat is a great tool to help students learn English. In my own learning and teaching experience, WeChat is widely used in following ways. First, I join WeChat groups, teachers can sharing all kinds of learning materials that students need through WeChat, which is very convenient. In groups, teachers can also ask students to upload their homework to check students’ learning progress. Secondly, there are lots of useful subscriptions on WeChat. Such as ‘China Daily’, which is mentioned by Julie, VOA Radio, BBC Listening and 21st Century, etc. These are all excellent English learning materials that can be easily get from WeChat. Thirdly, some materials shared by friends and teachers through Moment are useful materials to raise students’ motivation, since most of these materials are closely related to online hot issues, celebrities and latest informations. And another asynchronous platform I would like to mention is BaiDu ZhiDao, many people upload their questions on to this platform and all the people who know the answers can answer the questions. Sometimes people ask about grammar and vocabulary problems, sometimes people ask for material sharing. But the disadvantages of this platform is that not all the questions can be solved immediately, some questions stay unsolved for several days or even longer, which cause some troublesome in learning. Hi Lissie, thank you for your comment. It is true that if we take full use of Wechat we can benefit a lot from this platform. I also used BaiDu ZhiDao and I think it is a very useful platform which can help us with some difficulties, although it could not be denied that there are some answers we are not sure of it’s accuracy. Hi Eric, Vicky and Grace Fu，thanks for your interesting post! Regarding your first question, I’ve had an experience of learning English by keeping in touch with my American friends through Facebook. Just as mentioned in those previous posts, there are pretty much the same pros and cons. Your mention of the drawbacks of CMC has really attracted me and made me consider the issue from a new perspective. As we have now developed some knowledge of online tools for language learning, it is almost a consensus the prevalent and new tool is conducive to language learning in many ways. However, as for the drawbacks, I used to think it is not very well planned and monitored either as you mentioned in the second paragraph, but now I kind of changed my mind and believe that maybe these drawbacks can also be seen as its advantages as well when taken from another angle. As you mentioned that some people argued that it’s not very well-organized and systematic, which I think is instead the main advantage of it. As we all know that the major characteristic featuring the teaching in the classroom is being systematic and coherent, and as a major difference, the CMC being free and versatile. Where there is freedom, there is uncertainty, and it is which that makes CMC unique and indispensable, for that’s what the learners lack under the formal educational system. In this case, learners may encounter various problems, both linguistically and psychologically, and they have to face them and learn to cope with them by themselves, without receiving help from teachers and parents. Consequently, learners will get used to it and develop a practical skill needed for dealing with real life problems. This is something that can’t be learned inside the classroom but is also essentially important in their real life communication. Therefore, I think before using the CMC, the learners should be informed and be aware of the difficulties they would encounter, so that they could try to deal with it positively. Thus, together with these two main methods, learning a language would be easier and more effective than before. Hi Ruby, thanks for sharing your opinion which is intriguing. If we think it positively, we can find some advantages and it will offer students a brand new learning experience outside of class. However, if a new language learner starts to learn English and depends on the learning materials from the computer, he will find it difficult if the materials haven’t followed the developmental order. As a supplement to the school learning, CMC does benefit a lot. Weibo is a CMC tool which provides some authentic materials about language learning and a platform for discussion (public comment area and private chat). When I was preparing the IELTS, I found some IELTS related accounts very useful. These accounts update some useful resources like vocabulary, sentence patterns, speaking model videos, etc. on regular basis. However, from my personal experience, albeit I found them applicable, I just simply “marked” them down but never write them down in my note. Also, since Weibo and Zhihu is Chinese-medium app, the discussion sections are mostly in Chinese. Hence, it seems to me that through these channels the spontaneous learners receive more input than generating output. But this situation can easily be improved by setting some rules like English-only in discussion space. I picture the ideal CMC second language learning will be like having a low-fee app which can act like a professional teacher, not only providing some personalized authentic materials but also acting as a native speaker to talk to and give some useful feedback. Hi Eva, thanks for your sharing. I’m totally agree with you about the input and output thing. When I saw a learning related push when I was washing Weibo, I would choose to collect it and see it later.But the thing is I always forget to see it, or after reading it, I forgot this knowledge because I didn’t take any notes or do output exercises. Hi Eva, I have a similar experience when I was using Weibo, I used to follow IELTS related celebrities on Weibo and marked a lot but seldom went through them thoroughly, it’s like various clips on Weibo to guide you kee fit if you follow the trainer, however, Weibo users barely do exercise by following clips, so this is a problem in terms of leaner autonomy. Unlike school eduaction which supervises students on a regular schedule, Weibo users can drop the “course” whenever they like. Therefore, for those who are not self-disciplined in language learning, CMC is not the best way. Thank you for your post regarding CMC in second language teaching and learning. When I learned ELTS in university, I used to practice spoken English with the help of “ELTS bro”, a useful app which enables learners to record their answer to the question and share it with others. Learners can not only improve their own oral English but can also learn from other people, because those who really perform well in a certain topic would receive many “like” and their answers would be placed at the top. By listening to advanced learner’s opinions, their good pronunciations as well as the way they organized the topic, I really benefited a lot from them. I think my experience of CMC in learning 2L is a positive one, because it increased my initiative in a relaxing learning environment and stimulated my motivation as I wanted to become as competence as those advanced learners. Hi, Lux, and glad to have the same experience in using IELTS Bro. I think you have listed a number of affordances on using this app. Apart from what you have uttered, I want to add that we can still utilize the ideas on this app. you may think this act as a kind of cheating, but actually, I am talking about how to make use of others’ viewpoints and transform them and internalize them as your input. For example, last time, when I was preparing for a topic on a stranger, I had no I idea how to generate my story. so I searched for the topic on the app, and listened to others. one of them talked about his neighbor as a stranger, because he himself just moved in. suddenly, it inspired me to come up with my own memory. in this way, can the app help us to broaden our horizons and enhance our flexibility in thinking. I really agree that WeChat is a very useful tool in the language learning process. Since the online teaching and We-media are becoming more and more popular today, many people are willing to share their skills by forming various WeChat groups. I have once joined a WeChat group formed by strangers who have interests in English movies and want to improve English by watching movies. At first, most of us shared the classical actor’s lines and tried to read and imitate the original sound positively. It was an interesting experience because I did know about lots of unknown knowledge about cultural background and some authentic oral expressions in English. However, this group becomes quiet after some time. The members are silent and seldom share anything including me. It seems that all the members are lost interests in this overnight. This experience also makes me consider the time controlling when we use the CMC in language learning. I think the most ideal CMC should be able to hold the users’ interests tightly, it can set a specific time limit, which enables users to have a sense of achievement that “Aha! I can learn it in such a limited time” so that the users will not get bored of it easily. Hi Danella, thanks for sharing your learning experience on Wechat and this is a common drawback of such kind of learning group. I suppose that another reason the group became quieter is that there is no leader or instructor, and participants can hardly get effective feedback, which may reduce learning interest. As you mentioned, it is also important to keep learners’ interest in learning when they apply CMC. Thank you for your effective summary on Computer-Mediated Communication and Second Language Use. 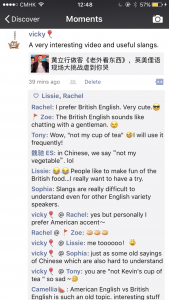 As for my own experience of CMC English learning, I would like to share my experience of interpretation practices with one of my e-pals that I met on Dajia Forum (club.TopSage.com). I was shy to make face-to-face practices with my classmates, and also felt discouraged and easy to give up on my own, but practices with my e-pal helped me overcome the above problems. In that period, we were responsible for selecting proper passages for each other as practicing materials, including audio record and manuscript in both Chinese and English, as well as the according translations, but only the audio records and interpretation records were exchanged between us. Then we marked the interpretation of each other and made detailed comments, which, on the one hand, motivated me to make more practices in my spare time to improve my interpretation abilities, and on the other hand, besides learning from her comments, I also paid attention to her errors and problems thus avoided making the same errors. Gradually, we made great progresses in interpretation and translation. And we also share efficient English learning methods on the forum. Dear Grace, thanks for sharing. I think e-pals does help language learning since you can share your ideas with them. It will also motivate one’s learning interest. But how will you solve the language problems when both of you don’t know the answers? Perhaps finding the answer is also a good way of learning. Thank you for your exhaustive weighing of both the advantages and disadvantages of CMC in language teaching. My response to my experience of using CMC in language learning is that I often chat with a friend who speaks better English than me in English via Wechat. I admit that this experience helps my English learning to some extent. However, after all the discussions of these IT tools, I am still confused and curious about how can we, as language learners, rather than as a language learners, to take the full advantage of these tools in our language classes. Gladly, I have seen some advisable answers to this question, among which are using Shanbay to assign vocabulary memorizing work, using Wechat to propose a topic and encourage oral messages, introducing the learning texts in form of Wechat dialogue, etc. However, it seems that most of the ways of using CMC in language learning happens after class which leads to the question that Annie has proposed – the workload of language teacher. Another question is that how much students will engage in these learning since they may be still unfamiliar with this kind of form of learning and have no one to guide them after class. Also, will parents be the obstacles for this kind of learning (for that I know that some students are not allowed to use electronic devices during workdays). Thanks for your addition about the issue that some students are not available to the electronic devices. I agree with you that students’ ages should be paid more attention beacuse inappoariate internet contents make some children or adolescents exposed to violent and sexual contents beyond their ages, which have long-term negative effects on their lives. However, for the college students who have a sense of self-control, CMC is a effective method for their second language learning. I believe CMC is an effective method in the second language learning since it allows the learners to get acquaintance with the native speakers. Moreover, it gives learners access to different cultures, which can broaden their horizons and let them more familiar with the local cultural customs as well as taboos. I hold the viewpoint that language learning not only includes the practical uses like listening, speaking, reading and writing since the use of language also involved with cultural contents. Having a good command of the cultural backgrounds of the native speakers can help the learners promote their ability to deal with different people, and it can also help learners to gain global versions. Take me for example, I once participated in the international cultural exchange association when I was a bachelor student. During that time, I got to know several friends for Thailand, Romania and Pakistan. Then we have a common QQ group and chat with each other frequently, topics varies from recent studies to their family issues. QQ(the social media chatting tool) plays a fascinating role in enhancing our friendships as well as promoting our oral English competence. I made friends with them, and taught them Chinese and introduced Chinese culture to them. They allowed me to participate in various customs parties of different countries as to learn the cultural differences over the world. In addition, these experiences help me to gain the opportunities to aided the president in organizing large-scale activities, such as 2013 New Year’s Party for Foreign Students and 2015 Thailand Students’ Culture Evening Party, which enables me to develop my career prospects. As for good ideas about how to ameliorate the CMC experience, I suppose that firstly learners should ensure the friends you made from other countries are nice people. Because I know some girls who made foreign friends just because they want to practice their English happened to be sexual harassed. Secondly, try to be more sincere and find your common interests, in this way the conversation topics are not limited. Hi Jiahe, your experience seems a positive example. As a tool of communication, CMC does help people to keep in touch with friends from a different cultural background and learn from others. Some other fellows shared their experience of forming a group to chat with strangers to practice English and turn out failure, your experience is succeeded mostly because you know each other in the real world and you can keep in touch consistently. This is also an effective way to manipulate CMC. I don’ t have much experience of CMC in learning or teaching a second language before, but one of my roommates had. She joined an online chatting room which aimed at practicing oral English when she was a freshman.But after a few days, she gave it up because in those chatting rooms in that websites, some of the English learners were fluent in speaking English, while some others were poor in both speaking and listening. For example, someone mistook my roommate’s English name “Echo” for ” alcohol” even if she kept correcting him. I think it would be better if that website could divided rooms into different levels and functions,and then the users could choose which chatting rooms they would like to go. Hi, Una, your roommate’s experience is similar to Danella, and the result is quite interesting. People like to join different kinds of learning group to improve their language, they have strong motivation but the result is not so satisfying. Companies should seize this business opportunity, lol. Thanks a lot for your invitation. CMC has been deemed as a new approach to arouse students’ interests in learning second language mainly for some reasons. From students’ perspective, computer itself can truly attract students to involve in the studying process than the old school one. Because most of them can apply computer technology without any troubles and they can use it as a tool to research some answers when they confronted with some problems. Furthermore, making personal connection and interaction online is able to ease the stress and provide some time for some introverted students who are not willing to speak in public. In the mainland China, we could see that CMC has become a trend in both school and education institution. What we should focus on is that we should provide a proper guidance for students in case they might be misguided when they use the internet inappropriately . Last but not least, as a language learner, CMC cannot be regarded as a way to improve the ability into a high level. It actually be served as a platform or a tool for second language learners to communicate and interact. Hi, Lavinia, I agree with you. I think teachers should manipulate the interaction features of CMC to arouse students’ learning interest. And I am not sure whether CMC can help to improve our ability to a high level. Personally, I read some articles from foreign websites, and I can comment and share my opinions with other users, I think it helps to some extent. Thanks for introducing CMC which could apply to second language learning. It reminds me of some experience for informal language learning in CMC. I still remember when I studied for my IELTS oral test, my tutor asked my to record my practice conversations and sent to her, then she would give me some feedbacks or instruction. Also, I could listen to my speeches again and easily figured out some mistakes I made in practice.It really helped me a lot in my spoken English. But I would say, it’s informal learning since the knowledge and skills are not quite systematic in CMC in my opinion. CMC does bring us convenience and access to language learning, but how to make it more formal in learning still a problem which depends on how we use it. Therefore, we are supposed to try more positive ways in CMC’s language learning. Just have more try, then we may get more!